Your website is often the first point of contact between your business and your clients. It impacts all stages of the customer journey from initial enquiry through to completing a purchase and potentially forming a long standing customer relationship. In order to effectively reflect the fluidity of your brand position and business offering, your website must be maintained regularly. If potential customers visit your website only to find outdated information on services and products you no longer offer, you might find it’s about as useful as a brolly in a hurricane! So, how do you ensure your website is maintained to the highest standard without it taking up your entire week? The best bet is to create a maintenance checklist and schedule each task into your calendar for completion. This way, you can ensure that your website remains regularly updated while minimising your maintenance time pressure. The following are five of tasks that should be included in any maintenance calendar. Analytics tools, such as Google Analytics, are your friends. They allow you to track how visitors find your website, which pages are particularly successful and which are not. Having a grasp of these figures is essential to the success of your website and overall online marketing strategy. They should be reviewed on a weekly basis to keep you fully informed and allow you to augment your content strategy to maximise success. When it comes to navigating a website there are few things more annoying than coming across a 404 error page. It’s thoroughly off putting as a potential customer and gives the impression of a lack of professionalism. That said, broken links can appear quite easily. If you forget to update a link after making even small changes to your website’s files, you could be left with a horrible assortment of 404 pages. The good news is that there is no shortage of tools at your disposal to help fix these issues. Google Search Console is a free to use service, provided by Google, that allows you to check for and fix indexing errors that lead to 404 errors. Alternatively the wordpress plugin ‘Broken Link Checker’ will continually scan every page on your website for broken links and email you if/when a new one appears. It is imperative that visitors to your site end up where you want them as quickly and as easily as possible. Navigating to your key pages and contact forms should require as few clicks as possible. If navigating through your website proves an arduous task, you’ll likely see your bounce rate fly right through the roof. Content is king. Not only does compelling content add pages to your website, it attracts visitors and allows you to position yourself as an authority in your area as well. Keep your content posts relevant to the services you provide as well as the needs of potential customers and you will be on track to turning your website visitors into valuable customers. Not only that but, consistently posting relevant content will keep you in Google’s good books, making sure that your website ranks higher in search results. Set a schedule, brainstorm content ideas in advance and stick to it. What is your website for? What metrics are you using to measure website success? Are you hitting your targets? Business and Online Marketing Goals are fluid, they don’t exist in a vacuum. Equipped with your latest analytics feedback, you should reassess your website goals on a regular basis. These goals should be written down and set for each quarter allowing you to measure successes and failings on an ongoing basis and implement adjustments where necessary. 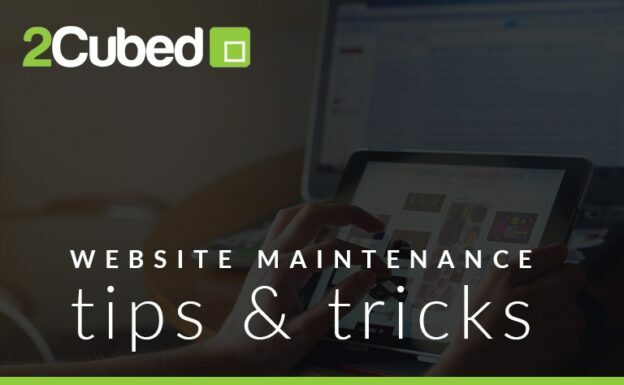 Developing and following an intuitive website maintenance plan is a key step on the path to ensuring that your website remains professional, user-friendly and accessible to your current and potential customers.